Technology saturates children’s lives. Schools use tablets and Smartboards. At home, kids are swimming in multi-platform games, streaming video, social media and mobile connectivity. The immediacy and control of digital media spills over into the analog world, too; I overheard my kids playing the board game, Life and one insisted the other “hit pause” while she ran to the bathroom. And I admit there are times when I wish they were born with mute buttons. Yet we still “film” an event and “tape a show.” Sometimes the original saying is just easier -- ‘give me a ring’ certainly rolls off the tongue more easily than ‘give me a Downton Abbey theme music.’ Despite these outdated expressions, what do kids make of the actual storage media and communication devices of yore (i.e., those I grew up with)? I asked the two 7-year olds in my house to weigh in. 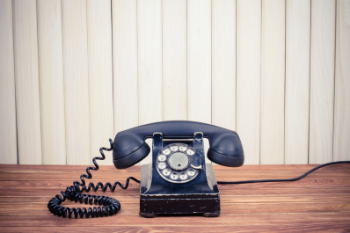 Once upon a time, people answered the phone with “hello” instead of “Yo, wassup?” For some reason we still say we’re “dialing” the phone, though the time it took call a number with a few ‘9s’ or ‘0s’ on a rotary phone would drive a contemporary kid bananas with impatience. My own kids were able to identify a rotary phone. “It’s an old fashioned kind of telephone. The circle thing makes the numbers go,” one said proudly, as if she had correctly recognized by name an ox cart. Until a year ago, our family drove a rust-bucket Toyota station wagon that had no AC, a stick shift and (gasp!) hand-crank windows. Kids would regularly climb in and, after futile jabbing at possible controls around the door lock and handle, require a lesson in the befuddling mechanics of window cranking. “Is this what everyone did in the old days?” one incredulous youngster asked. I explained we only rolled them up during pterodactyl attacks. Every time we take digital pictures, there’s an immediate “lemme see!” from the kids. The idea of taking photos (36 shots max), hoping your shot came out, and then waiting a week to get the prints back from the drugstore (only to find out everything was out of focus)? Unthinkable. 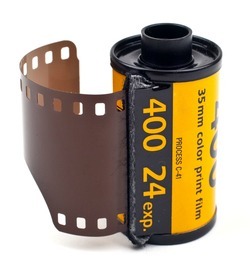 The roll of film I found in the fridge (Kodak Tri-X black, expiration date 2004) left the kids scratching their heads. One guessed it was a “camera roll for a tape” whatever that means. The other just stared at it suspiciously, as if it might be packed with deadly spiders ready to explode at any second. Cassette tapes held a maximum of 120 minutes of audio. A 2 TB hard drive of about the same dimensions can store around 1,000,000 minutes of audio (and you don’t need to “fast forward” to get to the next song or “rewind” it when you’re done). The kids studied the cassette for a second and one responded: “You put it in and it plays music. I see that kind of stuff in TV shows.” Somebody’s been watching the History Channel, apparently. 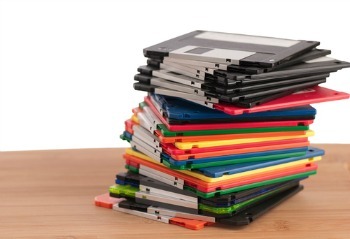 Floppy disks – out of our lexicon, thank goodness. 3 ½ -inch disks hold a whopping 1.44 megabytes, enough for about one-fourth an MP3 file of Madonna's "Like a Virgin." The earlier, 5 ¼ inch floppies (you know, the ones that were actually “floppy”) maxed-out at 280 KB. The kids guessed the discs contained data: “I think they’re CDs. They play stuff.” Though the one in my possession contained a poorly written term paper on gender roles in Shakespeare’s comedies (I think I got a B- on it). Definitely more work than play. My 32GB microSD card is about the size of my pinky nail and can hold the equivalent of over 22,000 3 ½ -inch disks – that’s a lot of bad term papers. The list of passé tech is long: dial-up modems, pay phones, answering machines, typewriters, etc., etc. For a certain set of older kids, however, this stuff has become cool again. A movement of artisanal audiophiles now covets vinyl LPs, cassette players, super-8 cameras and other “slow” tech. This means, of course, that one day the iPhone will be a must-have retro device for the hippest kids around, so hold on to it. Your kids might thank you one day instead of rolling their eyes at the mention of what is clearly pre-Civil War technology. After my father in law passed away we inherited his old 1950’s manual typewriter and an IBM Selectric that even still had some correction tape. My 7 and 8 year olds were transfixed by the all the sensory feedback—the moving letters, the tap-tap-tap, the return carraige. (One wondered how you “Save” when you’re done writing.) They spent days giddily composing. Eventually the novelty wore off and the typewriters are back in a closet for now. Hopefully, someday I’ll be able to lug them out and mesmerize a grandchild or two. When I was in typing class (circa 1981), we used to goof off by making pictures/designs using the typewriter, instead of typing out the exercises like we were supposed to. If they haven’t already figured it out, the kids may enjoy this as an additional way to play with your relics.